Skill level: Intermediate to advanced, or a Brave and Fearless Beginner. The most difficult stitch used is the nupp, and that can be left out or replaced with beads. The rows do get very long towards the end, however, and that makes it a bit of a challenge. The pattern is offered in two versions, one with significantly more mesh along the increase lines than the other. Both are included in the price! 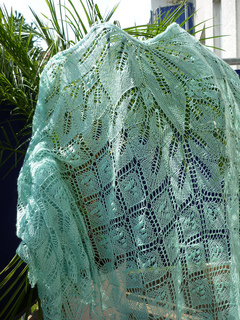 This shawl has a somewhat unusual shape, made by increasing approximately 6 stitches every other row. It is knit from the top down, meaning that you begin with a few stitches in the middle of the longest side (the neck), and end with the outer edge and half a million stitches to BO. Special techniques used: Provisional CO, nupps (or beads), knitted sideways BO. 180 x 75 cm (71 inches by 29 inches) relaxed after blocking. Using 100% wool yarn will give you a larger shawl, as the silk content in my experience has a tendency to relax more than wool. 100% wool will give you a shawl measuring approx. 200 x 95 cm (79 x 37 inches). Gauge depends on your needle size and personal taste. Also needed: Patience, stitch markers, scrap yarn and a crochet hook for the provisional CO. Beads if you like.